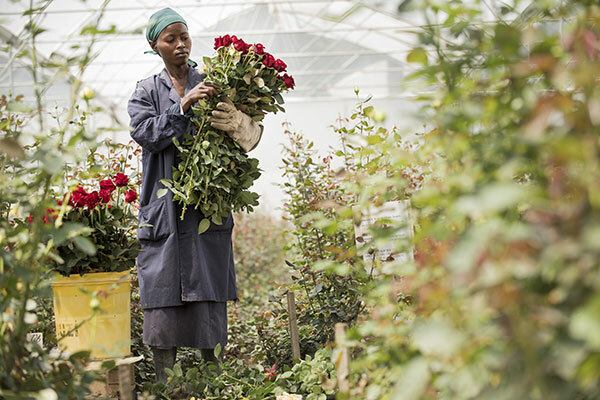 Maggie Hobbs, and her husband Tim, own Tambuzi , a Fairtrade farm in Kenya, where they grow the scented garden roses, herbs and foliage that appear in our bouquets outside of English season. This year, our new florist shop is taking part in Chelsea in Bloom, and embracing the event’s Safari theme. 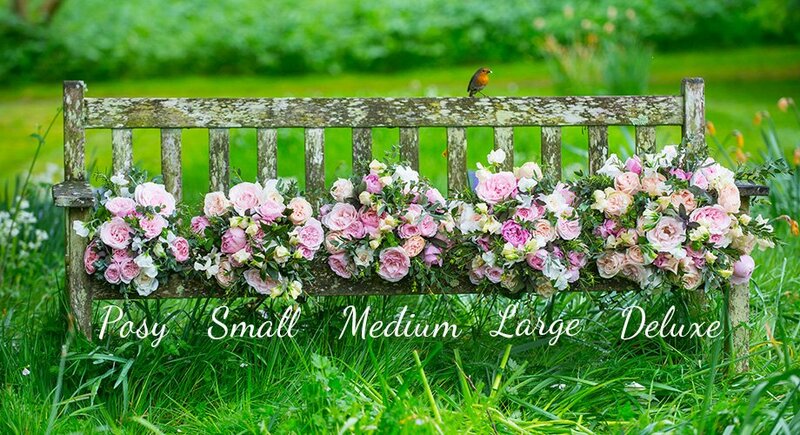 Maggie will be providing us with stems to decorate our store and also helped The Real Flower Company decide who to donate money to this month with the launch of our new charity bouquet. Here, Maggie discusses Tambuzi’s environmental responsibilities, Chelsea in Bloom and our charity choice. “Tomorrow I will join a youth group in our local town Nanyuki on a very small sister march to the People’s Climate March, taking place in Washington DC. Kenya is in some ways on the front line of Climate Change, but we all know in our hearts that soon the effects will be felt all over the planet in a myriad of different ways. Marching at least keeps the issues in the forefront of the political debate. 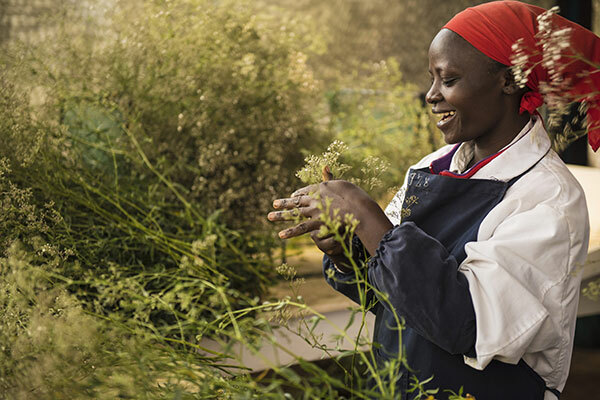 At Tambuzi we are very aware that many people believe that growing flowers on the Equator and sending them to Europe constitutes a lack of care concerning our shared climate. However, I wish that everyone who is interested in the subject could come and visit the farm and see how seriously we take our environmental responsibilities and the impact that providing jobs for over 500 people in the local community has on facilitating the dignity of work and increased family income. With those jobs has come the opportunity to buy solar lighting for homes, energy saving stoves to cook on and bicycles to ride to work. 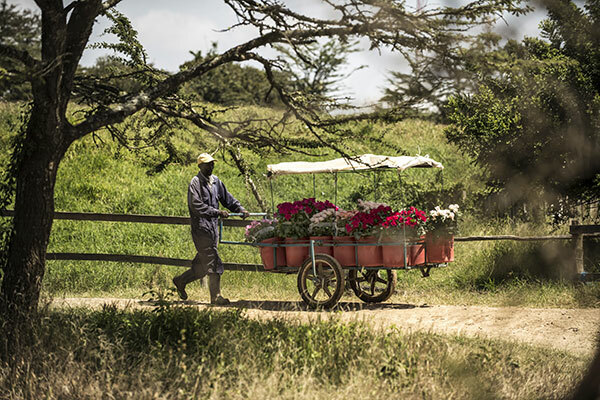 If any Real Flower Company customers are ever visiting beautiful Laikipia on safari, let us know and we would be happy to show you round so you can see for yourself. 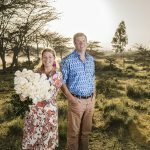 And the notion of a romantic Kenyan safari leads me onto how excited we are that the theme of this year’s Chelsea in Bloom is just that – Safari. We at The Real Flower Company take this serendipitous theme-choice as an exceedingly good omen for the opening of our new shop in Cale Street, Chelsea, just in time to be decorated in an African theme. I know that the staff there will lovingly bedeck the tiny boutique shop with gorgeous African blooms, and I recommend you make the effort to visit ours and all the other local shops as they display their Chelsea in Bloom finery. Although Tambuzi has been blessed with the April rains and our dam has filled, others have not been some lucky. As a response to the drought that is ravaging other parts of Kenya, we have designed a beautiful new bouquet for May. Working with our friends at the local Nanyuki Branch of The Kenya Red Cross, funds raised from the bouquet will be distributed to those worst affected by the drought. Please let us know if you would like to learn more about this relief work. 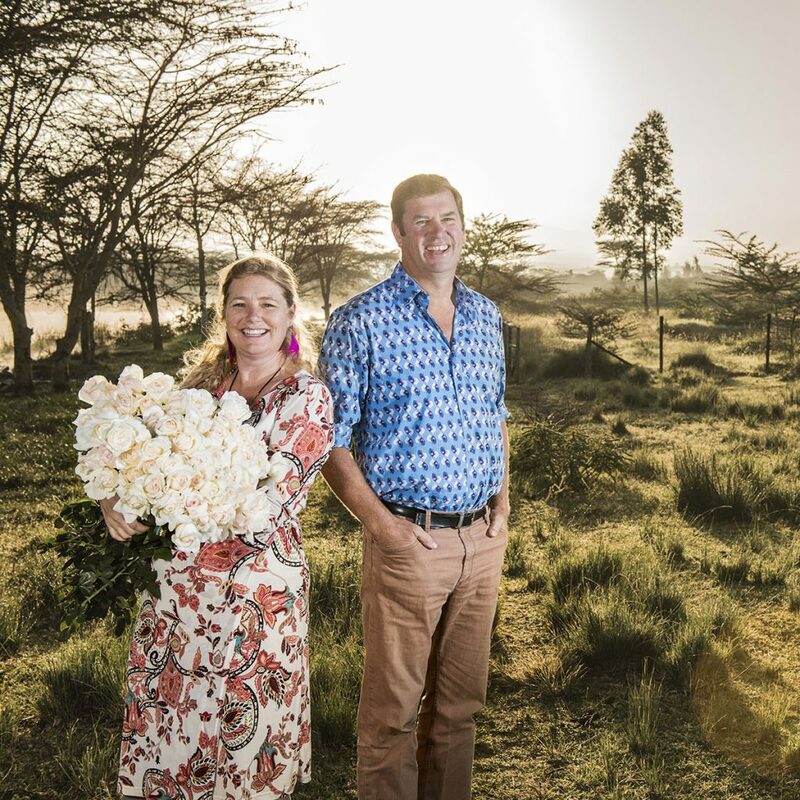 I think that this initiative typifies the origins of our relationship with Rosebie and Matthew Morton (the founding owners of The Real Flower Company), which started over 20 years ago. 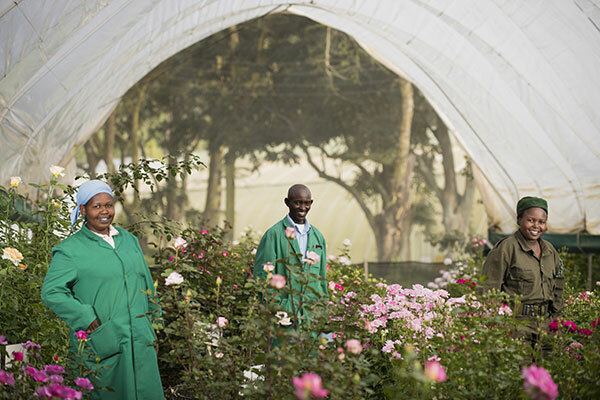 We jointly realised that by working together in the winter months, when beautiful scented roses cannot be grown in Britain, without extensive heating and lighting, we could grow the roses here on the Equator under the African sun, bringing jobs and trade to Kenya and beauty and joy to UK customers. And now, when Kenya needs a helping hand, our customers can help support those who are suffering from our common climate change threat. To find out more about Kenya Red Cross click here.